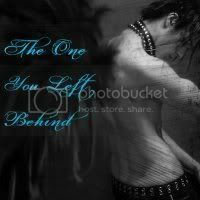 Please read the page "The One You Left Behind- Disclaimer and such" at the top of the page before you read this. This is entry 1 of a mini series to read all other entries please see the link section in my side bar near the middle of the page, right below blog archive. Cant miss it. :) Thanks! Ok, so I'm not so sure how this is gonna go. I kinda figured only crazy people talk to the dead, but now that I'm on sentence number two I wonder, "Am i crazy?" I mean I know I'm not saying anything but does typing a letter to a dead person make you crazy too? I can't be too sure these days. Well anyways that is besides the point. The reason I wanted to start writing today was because..., well you know the reason. I mean if there is a heaven and hell you know the reason. And that makes me wonder too. Are you as good as everyone thinks you are, or I guess I should say were? But did you do anything that would keep you from getting into heaven. I mean if there is one, are you there? Well, I'm just going to pretend that you are because thinking of the possible reasons that you could not be in heaven are...DISGUSTING! But since you are in heaven and you know what it takes to get there, would I get in? I mean I'm only 15 but you have seen what I've been doing the last 2 years. It just seems like maybe I'm headed down the wrong path already. Thats kinda one of the reasons I wanted to start writing to you. I mean I was doing great when you were here, but thats because I told you everything. Even that secret, you know which one, you knew that. And now, now its like I have to start all over again. I have to make new friends, who I have to tell that to, and they might leave me behind because of it. I hate being left behind, but I hate having to hide from people just because, I'm different. You know that guy. He is awesome. I hope he is going to North too. He helped so much these last two years. He was the reason I could tell people my secret and not feel bad about it. What if he doesn't go to North? NO! What if he does go to North and starts telling people before I do? Should I tell him not to tell people? In a way I kinda want people to know I just don't wanna go through the embarrassment of being asked in front of a huge group and then laughed at when I give my honest answer, so I lie. I've gotten pretty good at it. I mean, I did it most of my life right. Only you knew and you didn't tell anyone. Or did you? If you didn't you lied too, but if you did you lied to me cause you told me you didn't. Why am I even writing you? You left me. I didnt have a choice in the matter. Its like you waited til I needed you most and you left. How could you do that? How could you be so insensitive to the fact that you weren't here alone. You had 2 people down here that needed you and you left us behind, without even a goodbye. You said you would always be here for me, but when I was all alone it wasnt you who was there for me to talk to. It was HER and part of me still thinks that she is the reason why you're gone. I dont know its just something odd about it. She sleeps in your room, in your bed, driving your car. SHE IS NOT YOU! She never will be, but I think she wishes she was. How could you leave me with her? You never yelled at us and made us feel like slaves, but she does. Why couldn't you take me with you? Why did you leave me here, with all these questions? Why am I even writing this? This isnt gonna work. You cant even write back. I'm done. Besides, I can't be late for my first day of high school. The one you left behind. Brutal Telling from the Wings of a Reawakened Dark Angel by Jay Fallen (JAF) is licensed under a Creative Commons Attribution-NonCommercial-NoDerivs 3.0 Unported License. Just remember that everything we go through in life makes us who we are today and I rather like who you are today but I also feel in my heart that I would also have liked who you were then as well. Good start to the mini-series. Very interesting start to the mini series. I can't wait to read what comes to follow. I know you kind of told me about it at work but reading it makes it even better. These are strange to read considering I'm your mom and I'm pretty sure you aren't talking about me lol. Why must you be so cryptic. Whut? I Poke. I Bash. Help!! I'm Surrounded by Penises!! All material on this site is copyrighted and can not be used without written permission.. Simple theme. Powered by Blogger.